"My brother's the Hulk" used to be my go-to line in an escalating 'My Brother's a...' schoolyard argument. My brother truthfully wasn't the Hulk - in fact I don't even have a brother - it just made sure I won. I mean the Hulk's the strongest one there is - who is gonna' top that? One guy who probably never had to stoop to such lows is the latest trend-setter to click 'follow' on IADW Craig Derosby! Craig and his two brothers flip a lot of cool out into the blogosphere from their trusty wee site derosbybrothers.com - check it out and let them know what you think! Welcome to IADW Craig, glad to have you aboard! Thanks for the warm welcome Dan. You've got a great blog here. 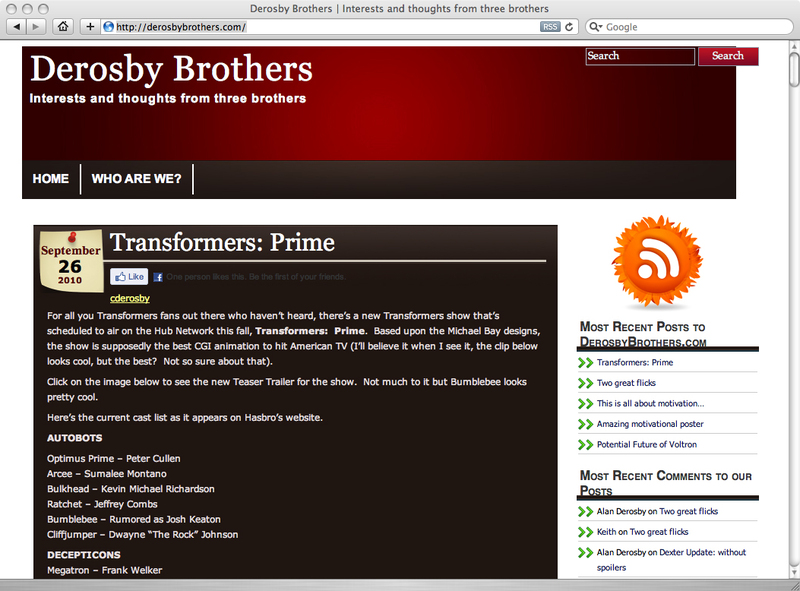 One of these days I hope Derosbybrothers.com looks half as good as this.